The androids created by noted 24th century scientist and cybernetics expert Dr Noonien Soong are the most advanced synthetic humanoids ever to be devised by a human mind. Data and his brother Lore, may possess superior physical abilities to organic humanoid lifeforms, but they are not infallible. The most important chink in Data`s seemingly invincible armour is what could be called an "achilles heel", a deliberate weak spot placed in the androids construction by his creator. The vulnerable point is a simple enough device - an on/off switch located in a small indentation on his back, close to the point on a human being where the pelvic bone and rib cage are situated. Data has quite literally no defence against the switch, and a push on the button renders the android completely inert. Given that Data is inclined to make modifications to his own subsystems, he has apparently installed some sort of timer mechanism, a bypass circuit to reactivate himself if he is deactivated by an enemy or by accident. The knowledge of the off switch represents a threat to Data`s continued existence, and so he guards the information well, sharing it with only a few of his acquaintences, Data first mentions the switch , in confidence to the Chief medical Officer of the U.S.S. Enterprise NCC-1701-D Dr Beverly Crusher, in 2364, in the same year, Lore impersonates Data and makes a point of telling young Wesley Crusher about the Soong-type androids` one major weak spot. In 2365, Data is moved to tell his "Grandpa" Dr IRA GRAVES, about his on/off switch, it`s existence is also discovered by William Riker in the same year, when the Commander is forced to act as a prosecutor in a court hearing set up to determine Data`s status with regards to sentient rights. Also present at this tribunal are Data`s commanding officer Captain Jean-Luc Picard, Captain PHILLIPA LOUVOIS, and Starfleet cybherneticist Commander Bruce Maddox. All of them are sworn to keep secret the court`s proceedings, but the hearing does mean that Data`s off switch, and his complete technical specifications, still become a matter of Starfleet record. Years later, in 2375, Admiral MATTHEW DOUGHERTY exploits this state of affairs by demanding that Picard and Chief Engineer Geordi LaForge provide him with information on their colleague, after Data apparently malfunctions during a mission to the BA`KU colony homeworld in the BRIAR PATCH. To date, Data`s off switch has only been used against him twice. The first incident occurs in 2364 when Lore uses it to defeat Data, and again in 2368,when Dr Beverly Crusher deactivates him while under the mind-controlling influence of a KTARIAN GAME. Data is also vulnerable to attack and injury in the more general sense. On occasion he has taken the brunt of physical traumas, such as impacts from shuttle crash-landings, plain and simple strikes and punches, and deadly discharges from PHASERS and other directed-energy weapons that would kill an ordinary organic life form. He is largely invulnerable to viral, drugs, or gaseous agents, but is subseptible to virus programmes that can infect and alter the functions of his internal systems. In early 2366, Data`s positronic brain is taken over - albeit with his permission - by a highly evolved microbiotic colony of NANITES for a brief period. He is later placed invoulatarily in the same situation by an energy being from the penal colony world MABU IV, a violent former prisoner intent on using the android`s body as a veichle for his escape. Data`s simple brush with a true organic infection comes early in his career aboard the Enterprise, when he, and the majority of the ship`s crew are contaminated by a variant of the Psi-2000 virus. The androids infection can be tracked to the presence of several biological components in his construction. Data is more subceptible to assaults targeted specifically at his android makeup. On a solo mission to TAU CYGNA V in 2366, for example, Data`s operation is briefly terminated by a colonist named GOSHEVEN, who uses an energy weapon to overload the android`s system and shut him down. 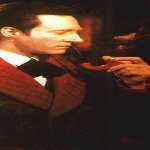 It could be said that Data`s greatest weakness is also potentially his greatest strength. Originally constructed without the capacity to emulate and experience emotions and feelings, Data advances and upgrades himself by installing an emotion chip in his positronic brain in 2371. After much deliberation, Data activates the chip, fabricated by his father Dr Soong and suffers greatly from emotional imbalance as the device fuses itself onto his neural network. At one point, his unstable state leads him to request that Captain Picard deactivate him until a way of removing the chip can be found. Data later develops the ability to activate or deactivate the emotion chip at will - and also remove it and leave it behinnd while on away missions - but his control of it is still overridden during his capture and interrogation by the Borg in 2373. Data`s rational thinking process is clouded with intense feelings of fear and desire, thanks to the Borg Queens manipulation of his nascent emotional state, but it is his loyalty to Picard and his crewmates that wins through at the decisive moment. Data`s chip-induced emotions are just as capable of being exploited and controlled as those of organic beings, but the freedom and strength with which they provide him makes the android more human than machine.